Professor Christian Ottensmeier is Professor of Experimental Medicine within Medicine at the University of Southampton. The Translational Immunotherapy Group is headed by Christian Ottensmeier, Professor in Experimental Cancer Medicine, and CRUK Senior Clinical Research Fellow. Our research programme has developed out of a special interest in the immunogenetics of B-cell lymphoma. Working closely with the Genetic Vaccines Group (Prof. Freda Stevenson), designs for individual DNA fusion vaccines targeting the patient-specific malignant B-cells have been successfully translated into the clinic. Phase I/II testing is complete in patients with follicular lymphoma, and ongoing in patients with multiple myeloma. 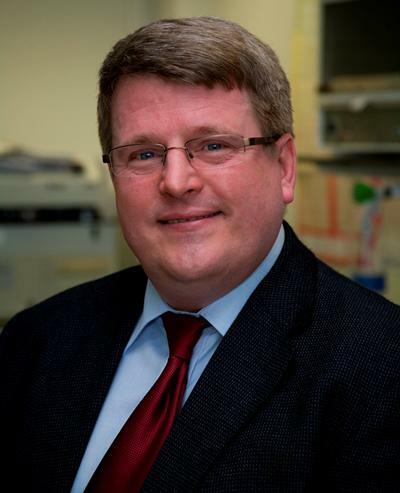 Professor Ottensmeier is also Principal Investigator of ongoing multi-centre clinical trials to test DNA fusion vaccines targeting solid tumours. The CRUK-sponsored anti-CEA DNA vaccination (ACVA) study for CEA-expressing cancers is currently recruiting patients from Southampton, Leeds, Edinburgh and Portsmouth, and the anti-Prostate Specific Membrane Antigen (PSMA) DNA vaccination study has just completed recruitment in collaboration with the Royal Marsden Hospital. This phase I/II study in prostate cancer is the first human study that also tests a novel physical delivery strategy to improve the efficiency of DNA vaccine delivery in humans (electroporation). This work is undertaken in close collaboration with Inovio. As part of the Translational Clinical Research Group, the group has invested major efforts into the development, methodical evaluation and validation of robust endpoint assays to provide the immunological tools for assessing the outcome of clinical testing within the stringent regulatory framework in UK and Europe. This has been enhanced by collaborations with the European Cancer Immunotherapy (CIMT) consortium, consisting of more than 20 academic centres throughout Europe. We are co-organisers of a European-wide interlaboratory testing initiative to assess the performance and reliability of cellular assays (tetramer staining, ELISPOT, ICS). A key aim is to develop assays to a high standard for inter-study comparablility and transparent assay reporting. Further complementary studies are being undertaken with the aim of increasing our understanding of the mechanisms underlying tumour immunology, thereby informing the rational design of new therapeutic approaches to cancer. In close collaboration with Dr Tony Williams (LINK), we are using FACS based methodologies to examine the relationship between tissue-specific Tumour Infiltrating Lympocytes (TILs) and inhibitory regulatory T cells (Tregs) in colorectal cancer. Multicolour FACS analysis of B, CD4+,CD8+ T cells and NK cells is also being used to evaluate the effect of systemic therapies on the immune system of patients with lung cancer and thymoma. Other strategies to enhance the immunological effectiveness of the vaccines are also being investigated and include the pre-clinical design and modelling and testing of novel DNA vaccines with different immunoenhancing adjuvants. The aim is to use these strategies for the next round of clinical testing. Khan, F., Ottensmeier, C., Popat, S., Dua, D., Dorey, N., Ellis, S., ... Danson, S. J. (2014). Afatinib use in non-small cell lung cancer previously sensitive to epidermal growth factor receptor inhibitors: the United Kingdom Named Patient Programme. European Journal of Cancer, 50(10), 1717-1721. Chudley, L., McCann, K. J., Mander, A., Tjelle, T., Campos-Perez, J., Godeseth, R., ... Ottensmeier, C. (2012). DNA fusion-gene vaccination in patients with prostate cancer induces high frequency CD8+ T-cell responses and increases PSA doubling time. Cancer Immunology Immunotherapy, 61(11), 2161-2170. Sahota, S. S., Zojer, N., Babbage, G., Joseph Pietras, D., Weston-Bell, N. J., vanderkerken, K., ... Ottensmeier, C. H. (2009). Defining Multiple Myeloma as a target for DNA fusion gene vaccines. Clinical Lymphoma and Myeloma, 9 (Suppl 2)(S23). Lee, S-M., Woll, P., Rudd, R. M., Gower, N. H., Ottensmeier, C. H., Ali, K., ... Hackshaw, A. (2007). A phase III randomised, double blind, placebo controlled trial of gemcitabine/carboplatin with or without thalidomide in advanced non-small cell lung cancer (NSCLC): C1-O3. Journal of Thoracic Oncology, 2(8), S359-S359. Stevenson, F. K., Campos-Perez, J., Sahota, S., & Ottensmeier, C. (2007). DNA vaccines to suppress myeloma. Haematologica, 92(6, supplement 2), 45-46. Hawkins, R. E., Dangoor, A., Keilholz, U., Schadendorf, D., Harris, A., Ottensmeier, C., ... Pearce, G. (2006). Phase I/II trial of a PrimeBoost therapeutic vaccine in stage III/IV metastatic melanoma. Journal of Clinical Oncology, 24(18S), 460S-460S. Hickling, M., McCann, K., Ottensmeier, C., & Ashton-Key, M. (2006). The Immunophenotyping of primary diffuse large B-cell lymphomas of the central nervous system. The Journal of Pathology, 208(S1), 22A-22A. Ottensmeier, C. H., McCann, K. J., Johnson, P., & Stevenoson, F. K. (2005). Immunogenetic profiling of follicular lymphoma reveals universal N-glycosylation sites introduced into the B cell receptor by somatic mutation and suggests relevance to lymphoma pathogenesis. Blood, 106(11), p.180A. Sahota, S. S., Forconi, F., Ottensmeier, C. H., Provan, D., Oscier, D. G., Hamblin, T. J., & Stevenson, F. K. (2002). Typical Waldenstrom macroglobulinemia is derived from a B-cell arrested after cessation of somatic mutation but prior to isotype switch events. Blood, 100(4), 1505-1507. Ottensmeier, C. H., & Stevenson, F. K. (2000). Isotype switch variants reveal clonally related subpopulations in diffuse large B-cell lymphoma. Blood, 96(7), 2550-2556. Sahota, S. S., Babbage, G., Zojer, N., Ottensmeier, C. H., & Stevenson, F. K. (2005). Determining mutational status of immunoglobulin v genes in chronic lymphocytic leukemia: a useful prognostic indicator. In Lymphoma: methods and protocols (pp. 129-144). (Methods in Molecular Medicine; Vol. 115). Humana Press. McCann, K., Sahota, S. S., Stevenson, F. K., & Ottensmeier, C. H. (2005). Idiotype gene rescue in follicular lymphoma. In Lymphoma: methods and protocols (pp. 145-171). (Methods in Molecular Medicine; Vol. 115). Humana Press. Wang, C., Wang, Y., Allen, A. J., Jobsri, J., Ottensmeier, C. H., Sahota, S., & Savelyeva, N. (2017). Plant viral vaccine delivery as a platform to induce cellular immunity against cancer antigens. Abstract from Virus-Like Particle & Nano-Particle Vaccines 2017, Singapore, Singapore.